There are many beautiful scenes (with a lake, a waterfall, a mountain stream, etc.) on the outskirts of Bandai-san (Aizu area) in Fukushima. Especially, lakes are very wonderful. 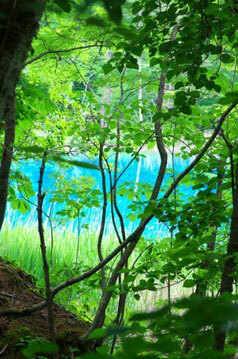 When Bandai-san（Mt.Bandai-san） erupted about 130 years ago, these lakes with various colors were born. The lakes have colors, such as "red, blue, and green", respectively. The scenery of these fantastic lakes gives people comfortable relaxation. If you visit the Aizu area in Fukushima, you will be able to enjoy these wonderful lake scenery leisurely.